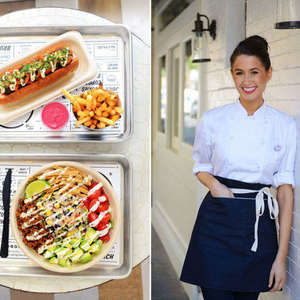 Chloe Coscarelli is the chef and co-partner of N.Y.C.’s vegan hot spot By Chloe, located in the heart of the Village. She is also the author of three best-selling cookbooks — Chloe’s Kitchen, Chloe’s Vegan Desserts, and Chloe’s Vegan Italian Kitchen. Chloe first earned national attention after taking the top spot on an episode of the Food Network’s hit reality-competition series “Cupcake Wars,” becoming the first vegan chef to win a culinary competition on national television. Chloe is a graduate of The National Gourmet Institute and the University of California, Berkeley. She also completed Cornell University’s Plant-Based Nutrition program. Two more By Chloe restaurants are set to open in Flatiron and SoHo in 2016, serving the same colorful, plant-based fare that made the original location a smash success.